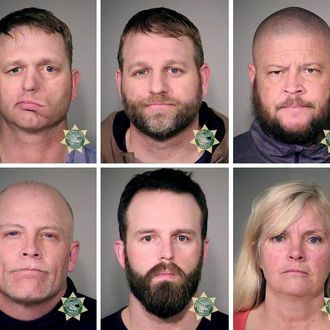 The latest from the bird refuge: On Wednesday, a federal grand jury in Portland indicted Ammon Bundy and 15 of his fellow Oregon occupiers, charging each with a single count of conspiracy to impede officers of the United States. As of Wednesday, four militiafolk still remain at the Malheur National Wildlife Refuge — all of whom are included in the indictment — despite calls from the group’s leaders to leave (and a notable message from Cliven Bundy to stay). They aren’t leaving until they are reassured they will not be arrested, and that doesn’t seem likely to happen. The occupation began on January 2, and last week, eight members of the occupation were arrested and one was killed in a confrontation with federal and state authorities. The indictment, made public on Thursday, also says that a couple of the ranchers and anti-government activists made specific threats. In October, “two conspirators traveled to Harney County, Oregon, to warn the Harney County sheriff of ‘extreme civil unrest’ if certain demands were not met,” says the indictment. If convicted, Bundy and the others in the group face up to six years in prison.